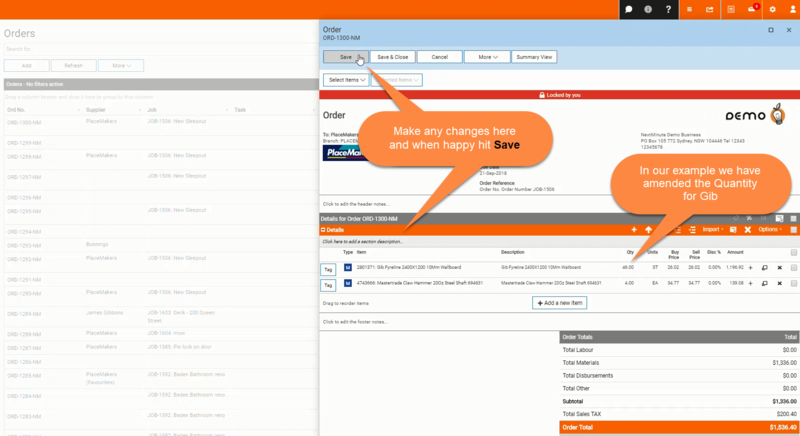 PlaceMakers Ordering – Welcome to the NextMinute support and feedback centre. Ordering materials in a timely and efficient way are key to keeping your jobs and projects on-track. 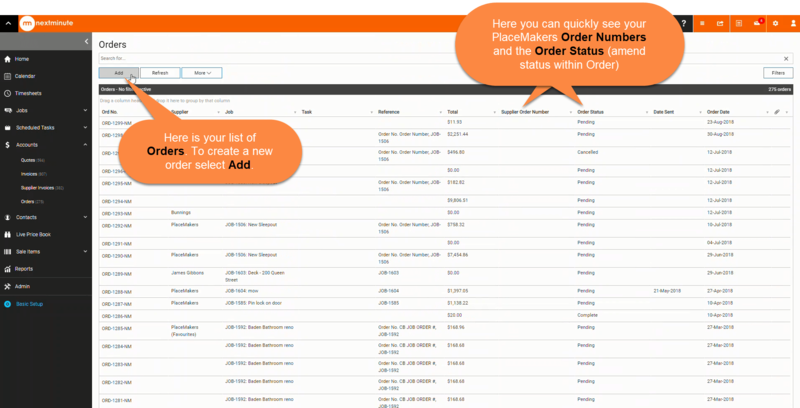 The NextMinute for PlaceMakers ordering enhancement will help you keep on-top of all your regular materials' orders with PlaceMakers. This help article will walk you through how to create orders in a few easy steps using NextMinute. 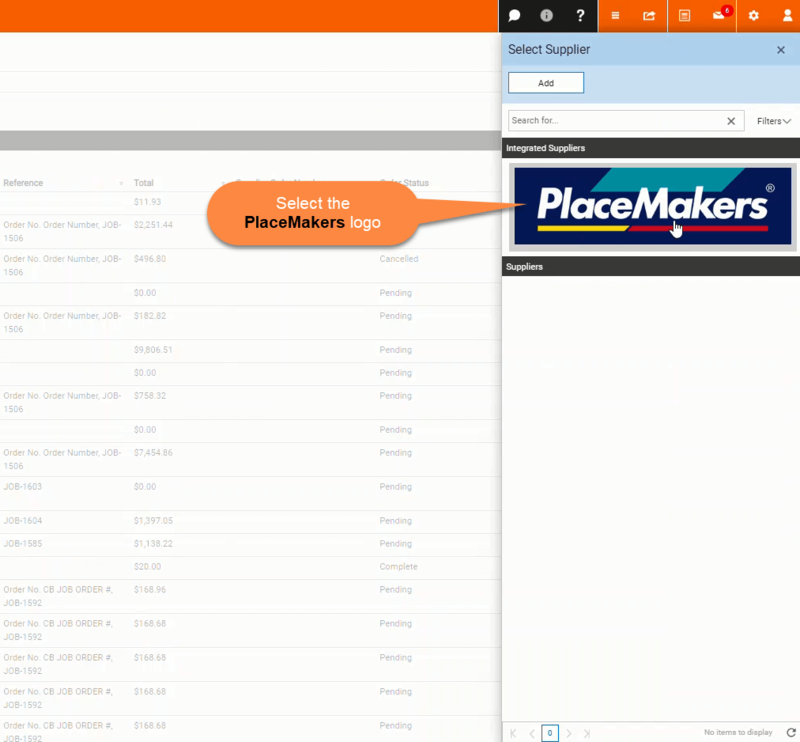 Note: You need to have an active "PlaceMakers Customer Account" in order to use the NextMinute integrated ordering to PlaceMakers feature. Please contact your local Branch for more information on setting up a PlaceMakers account. 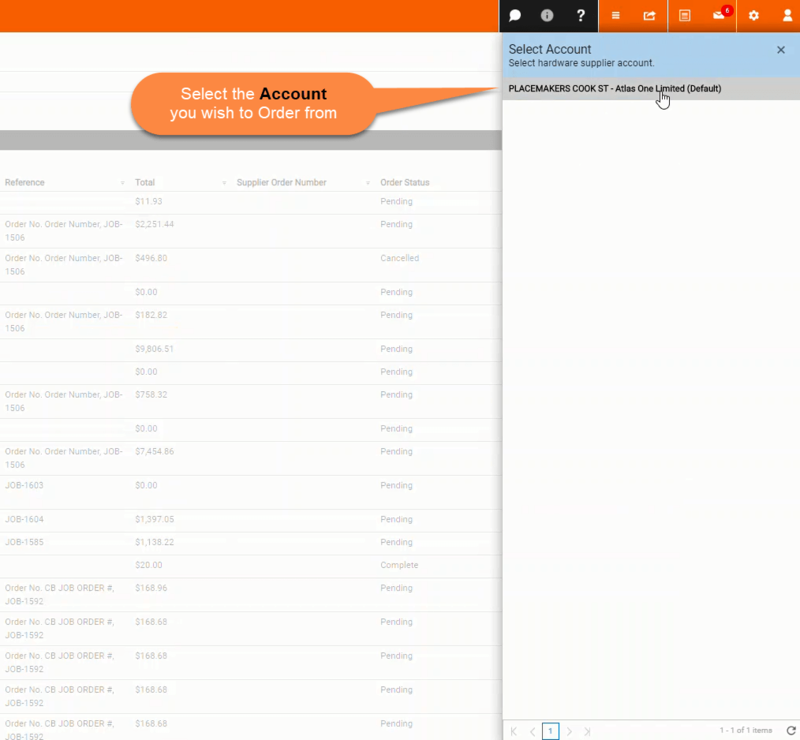 Select to Add a new order from the Add on the Orders page. 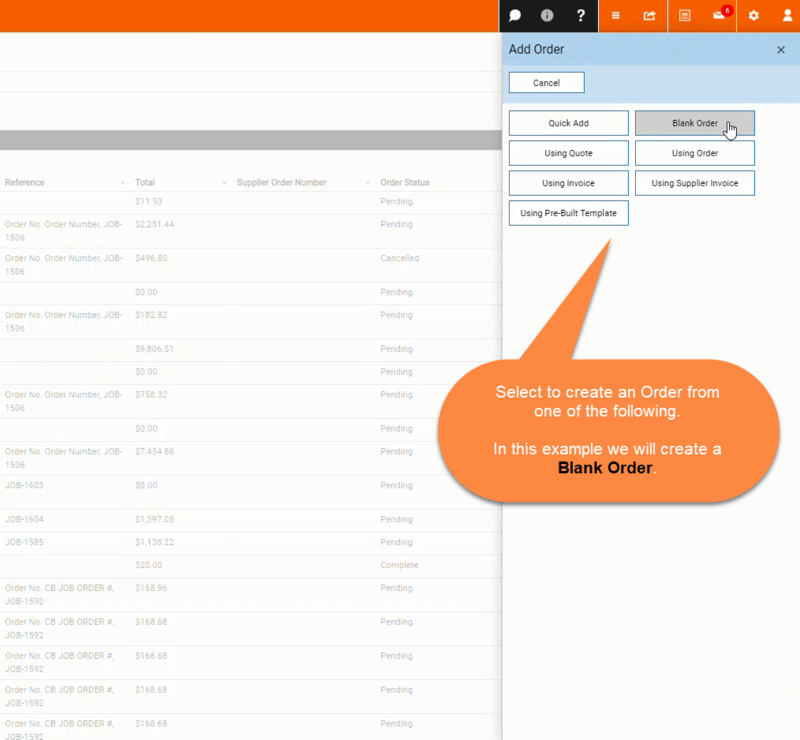 Your Orders page will show the Order number, Supplier, the assigned Job and/or Task, a reference, Total $ amount, Supplier Order Number, Order Status and Date Sent. 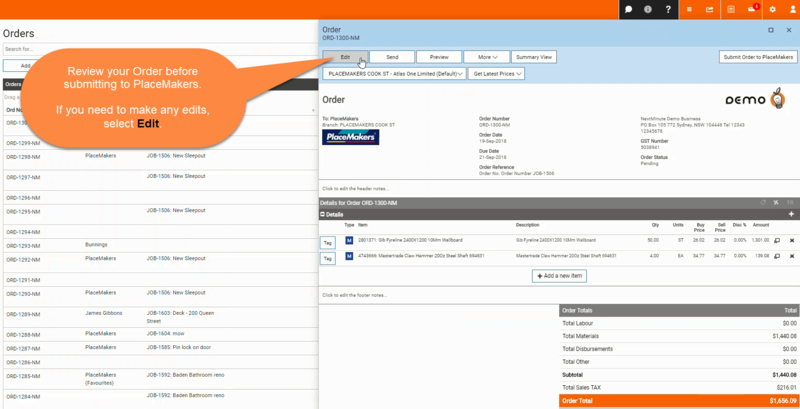 To amend an order Status, click into the Order, select More and Set Status. 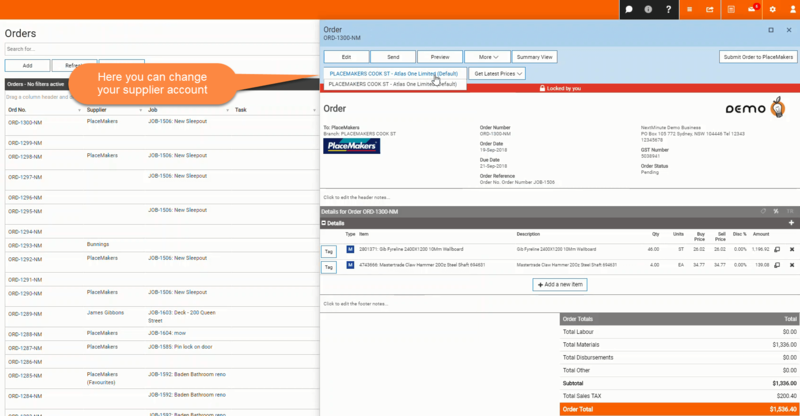 Using a Blank form (which we have selected in this example) or using a Quote, Order, Invoice, Supplier Invoice or Pre-Built template. 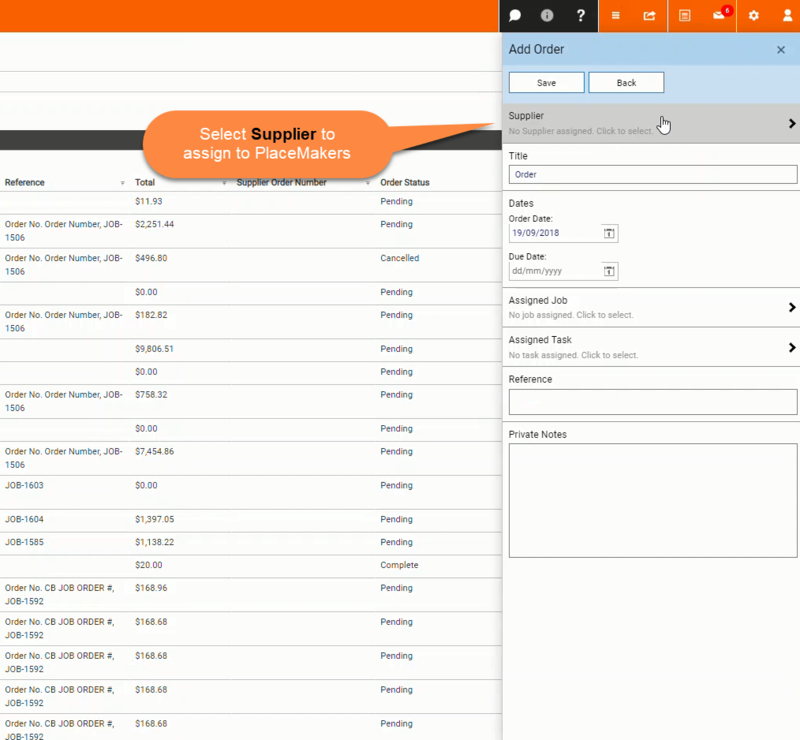 Select Supplier to assign to PlaceMakers. If there is no PlaceMakers logo (as shown below), you will need to refresh your Hardware supplier integration by going to Admin > Setup Hardware Supplier Integration and select Refresh Integration. If you haven't registered for a KnowMe account and completed this integration follow this article PlaceMakers Know Me Set Up & Authentication Process. You may have multiple accounts to select from. 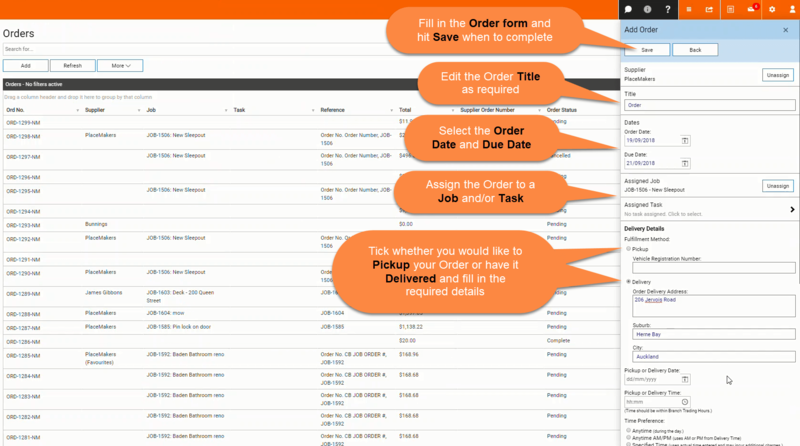 Edit the order's Title, select the Order Date and Due Date, Assign the order to a Job and/or Task and select whether you would like to Pickup the order or have it Delivered to an address. If you need to make any edits to this form, after saving, you can by selecting the Order header. If you have created an order via a Job then the Job is already assigned. In this example we have chosen to Deliver. Enter the Order Delivery Address. 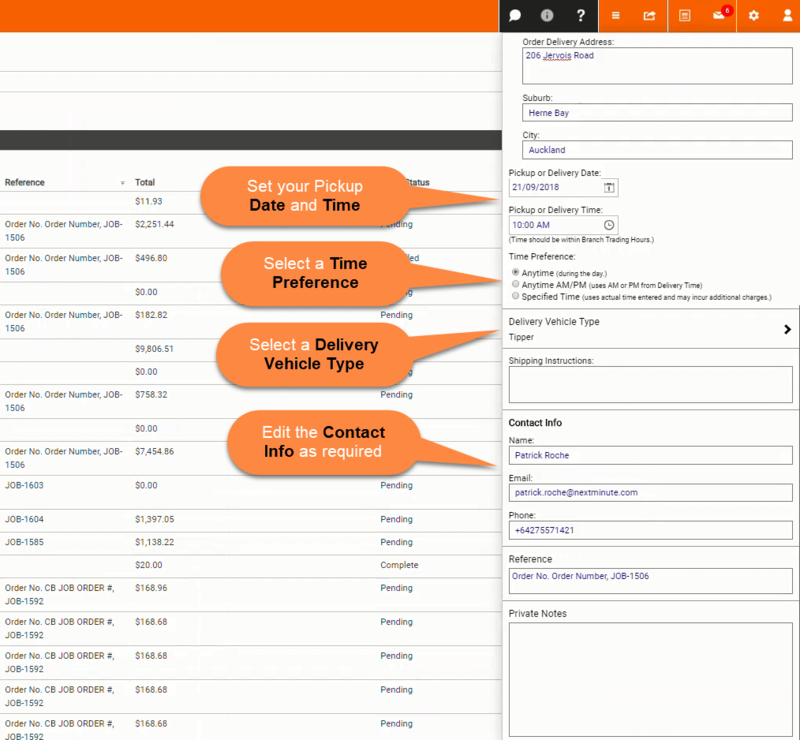 Add the desired Delivery date and time, select a time preference and select a delivery vehicle type. Edit the Contact info as required. 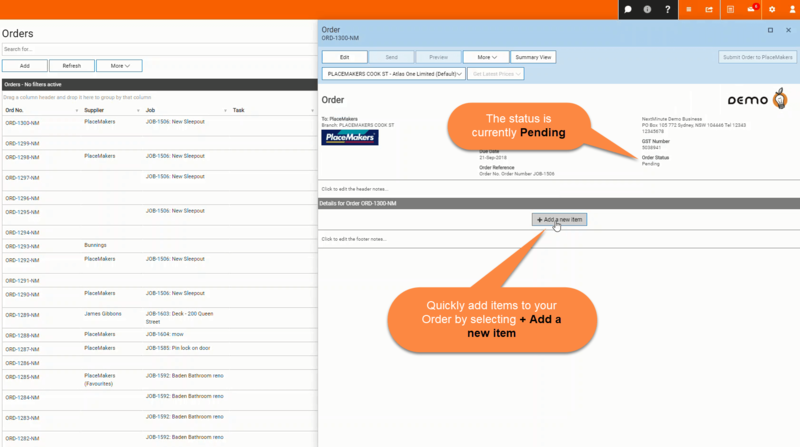 The status of your order will now show as Pending, add materials by selecting the + Add a new item button. You can also select Edit to make any changes to quanities and add more materials. 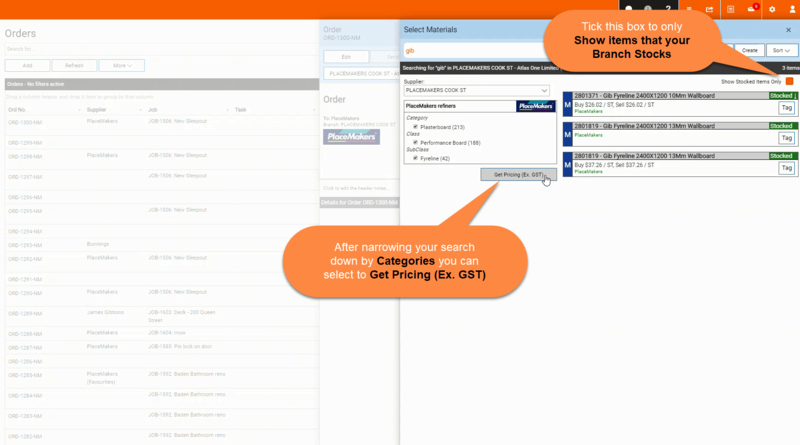 Search for PlaceMakers products and materials using the search bar and narrow your search down using the refiners. 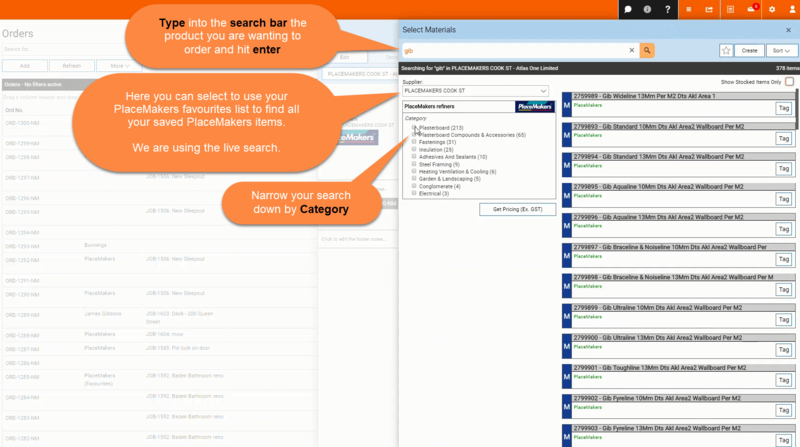 Select the supplier to change to your favourites list where you can find all of your saved PlaceMakers items. We are using the live search. 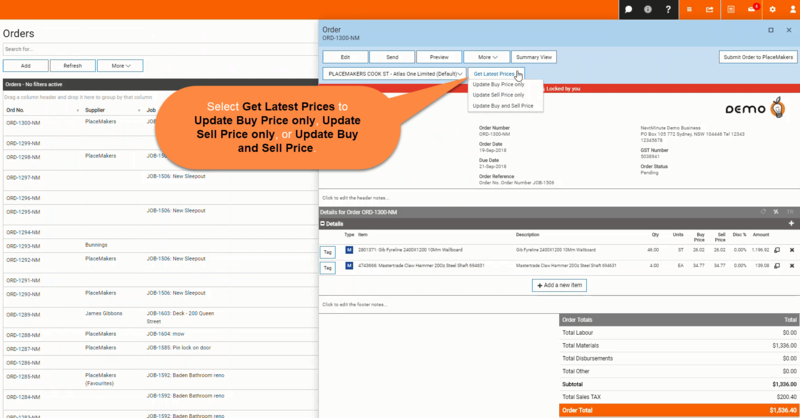 After narrowing your search down using the refiners on the left, you can select "Get Pricing" to view product pricing. You can then tick to only Show Items that your Branch Stocks. Note: they may not be in stock. After selecting an item, enter the quanitity and save. 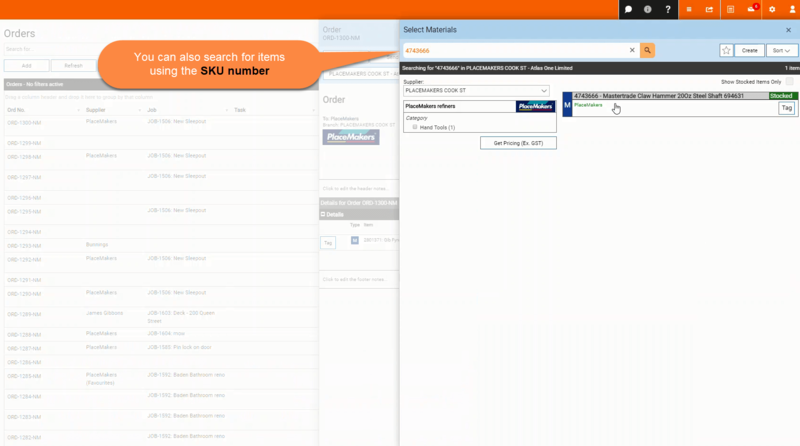 Eneter the SKU number in the search bar, select the material, add quantity and save. 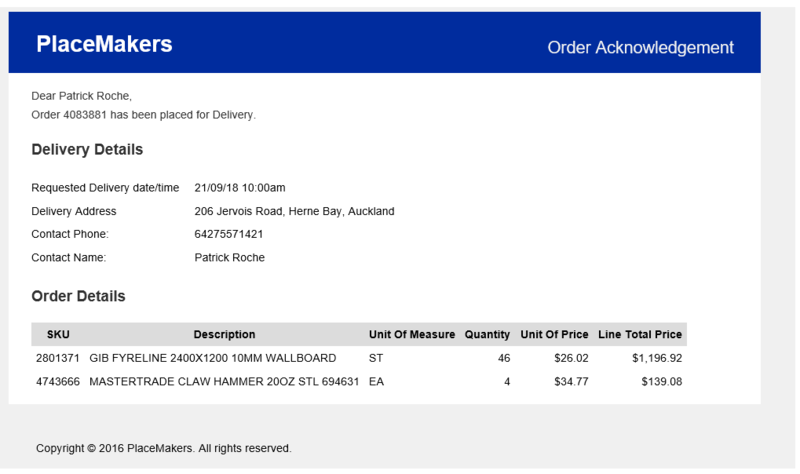 In this example we have amended the quantity for Gib, you can also Tag line items here which will save these products locally to your Sale Items Materials list. 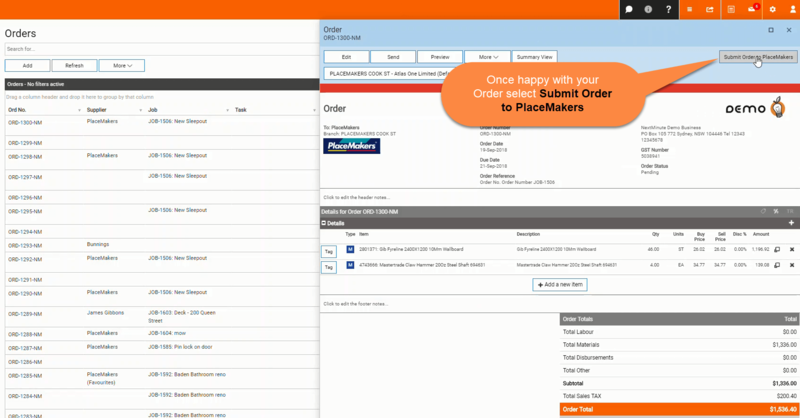 After submitting your order you will receive a confirmation email from placeMakers. Your branch may also call you to confirm your order.